Does anyone know how many Fregates there are in this country..? 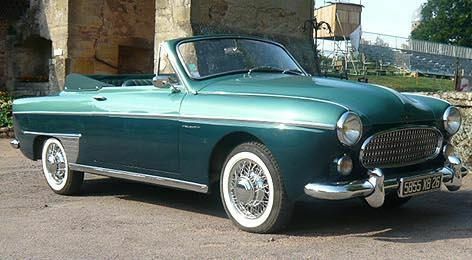 I came across this image of a Henri Chapron styled convertible and reckon it would be a dandy project for someone. Here's a Chapron Fregate - very rare - in Paris. I can think of about eight, about half of which may be runners. I still like the idea of a chopped and slammed Fregate with a bit of Renault related Nismo action under the bonnet. Sounds like just the project Graham needs! Donor car anyone? There was one for sale in QLD a couple of years ago, a burgandy coloured one. I may be getting myself mixed up, but I recall a story about it being a ex-consular car and used in the melbourne olympics for transport? One of RCCA members has a nicely restored black one, it was there last Sunday at our AFCD. He also has a very hot Dauphine with a 16TS or R18 engine that has been off the road for quite a few years now. I was talking to him about the perils of engineering and registration of such a beast on Sunday. As it has lapsed for some years, he will now probably have to resort to putting it back to at least R12 spec or less to be able to get it registered or on club plates. There was a black one at the FCD in Sydney last Sunday. The burgundy QLD Fregate was sold to a French restaurant owner (Le Brassan?) in Flaxton, near Maleny, a few years ago. He had said he was looking to sell the car recently, but I would guess you might need $20K to get it from him. Saw 2 of the convertibles at Renault's Historic workshop, 1 was being restored. Certainly rare and I would think expensive to buy and restore. Never heard of one in Australia. Sunroof on here has a couple of Fregates, at least one of which would be good thing for restoring, but like many of our cars, would have to done out of love, because there would certainly be no money to be made out of it, if looking to sell on afterward. I don't know if Rob would like to sell, but I am sure his wife would be happy to see them gone. There is a Green and White one some times in a car yard on the way to Gatton or perhaps Toowoomba. It is missing rear bumper and possibly other bits. They always wanted too much for it. It was there a few months back. I owned it for a short while and took it to a Renault Display Day in the 80's before Grand Display days were happening. It was a goer but the brakes needed re doing at that time. Sold it to my mate who then sold it to some young guy that was going to hot rod it. It was last being used to get some bits from for the above Burgundy car. Not sure what remains now. There was one in a yard at Stanthorpe for quite a few years. It had factory wire wheels but needed a lot of work. For example there was no upholstery and the boot had been opened with a crow bar. Our mate at Drayton had one in complete condition in the 1980's, but it needed at least a coat of paint and possibly more. Bet he still has it too. There was three in a wreckers yard at Kingaroy but they stripped any good bits and put them in a shed and then crushed the bodies. Being a wreckers and shed space being tight they may have dumped even the good bits by now. I have a couple of detailed photos of a convertible being restored by the Renault Classic Workshop in France if you want to see what was done to them. I have a lot of info on Fregates as I have one car to restore and one for parts that has rusted in half. If you get one for a project G come and have a look see. These are very heavy cars every thing is truck like you need big spanners, and engine hoists etc to lift the suspension units. But they do ride well. Even in the 50's Renault considered their cruising speed to be 75 MPH. Would have needed a good long run up to get there given they weighed more than 1 tonne and a half and only had a two litre engine. I have found the photos of the cabriolet being restored by Renault Classic. There are 15 photos and think that is too many to put on here. Are you going to Christmas in July if so I'll put them on a stick and bring them along. Henri Chapron only built 7 cabriolets. Where as Letourneur et Marchand built around 69. One Fregate parts manual lists them for mechanical parts but says all body parts must come from the body builder direct. They were sold by Renault agents and I have some details about how to order one etc etc but first you had to buy a top of the range Fregate Grand Pavois, and they were not cheap. I really think this would be a challenging project for you and when finished would be rare enough to get international coverage, particularly in French motoring magazines. I also have a magazine article about one that was restored in France. Here are two photos to wet the appetite. somewhere! Pilbara, Bowen Basin, Melbourne? Gumtree has a Fregate at the moment and it's in QLD. Someone could make a damn fine hotrod out of that.. I wonder if it is actually 100% complete..? It'd be a miracle if it was..
Master G, should it be missing some bits, I am sure you can whip them up in no time and amaze us yet again. Anyone got any spare shed space..? One of the downsides of 450 m2 block is no room. Yes, you have MG when I baby sit the Floride for you. All times are GMT +11. The time now is 05:16 PM.